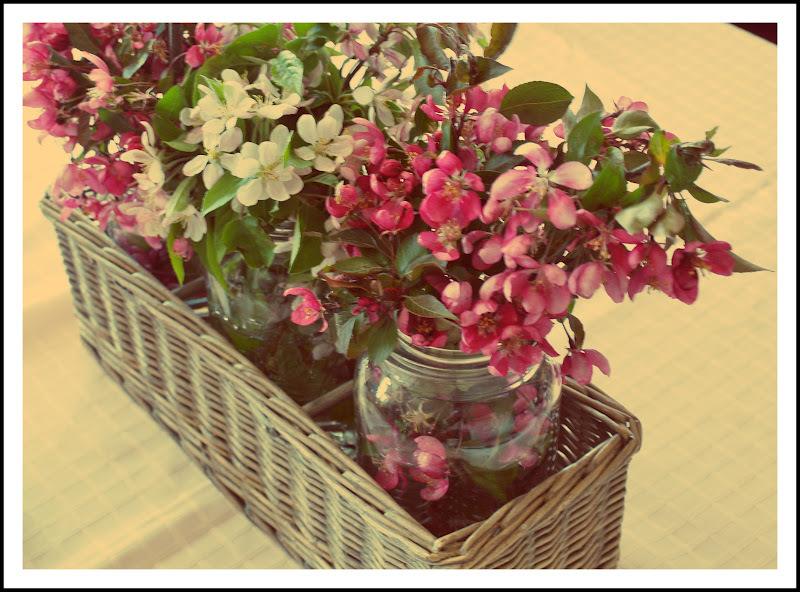 At a recent family gathering, I decided to make a floral centrepiece using three vintage canning jars inside a basket that I had in my storage room. I wanted the arrangement to be inexpensive, but I couldn’t find any suitable flowers at the grocery store. So, my visiting brother-in-law snipped some blooms from a nearby tree and my sister-in-law carefully groomed them and arranged them in the bottles. I think it turned out to be very pretty, and it was certainly affordable! It puts me in mind of one of my favourite poems. When the kids were toddlers, I used to show them the Baby Einstein dvds, and there was a snippet of this poem recited in one of them. So, this poem also reminds me of those sweet toddler years. Just gorgeous! I adore fresh picked bouquets-- something so casually elegant about them-- and the bottles/basket is just perfect for them! Thanks Tabetha! I love fresh picked flowers too, particularly yellow and purple wildflowers. That is so pretty!!! I love how you put them in canning jars! Perfect!!! Thanks so much for sharing at Thursday's Temptation. Thanks Jenny! I will definitely check it out! Love this little arrangement with the cherry blossoms - Beautiful! I am featuring your cute flower arrangement at todays link party! Wahoo!! Thank you Jill! That is very exciting! I'm heading over to look!